Finding a good man (and woman) requires a lot of trial and error. Flannery O’Connor’s short story A Good Man is Hard to Find does a good job of nailing mankind to the cross. The devout grandmother and her family in A Good Man is Hard to Find are self-absorbed in their own welfare and indifferent to the plight of others. The children exchange comic books on the trip to Florida as a black child, too poor to wear britches, stands in front of a shack. A car accident leaves them stranded on a dirt road. The Misfit, “aloose from the Federal Pen,” finds them and shoots them dead in the woods. “‘Pray Jesus, you ought not to shoot a lady. I’ll give you all the money I got!” says the grandmother pleading for her life as her family is executed in cold blood. “Jesus was the only One that ever raised the dead.” The Misfit continued, “and He shouldn’t have done it. He thrown everything off balance. If He did what He said, then it’s nothing for you to do but throw away everything and follow Him, and if he didn’t, then it’s nothing for you to do but enjoy the few minutes you got left the best way you can- by killing somebody or burning down his house or doing some other meanness to him. No pleasure but meanness,” he said and his voice had become almost a snarl. The grandmother touches his face, acknowledging he is one of her own, like the black child without britches. He recoils and shoots her dead. “She was a talker, wasn’t she?” one of his partners says. Economics writer Tim Harford talks of the importance of trial and error versus the God Complex in a TED Talk last year. The God complex keeps us from acknowledging mistakes and recognizing the incredible importance of good mistakes that lead us in the right direction. We’re too much the grandmother in O’Connor’s short story, and other characters in her great work, or worse, like The Misfit. We play God in our own little world. School systems validate the God Complex with tests that always have a correct answer. The real world doesn’t work that way. 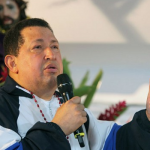 The Misfit Hugo Chavez, dying of cancer, now pleads and cries out like the grandmother for Jesus to save him. The victims of his tyranny are like the black child without britches. If so, use it. Carson thrives on his formula for risk taking which is very similar to what Tim Harford explained in his TED Talk. Creativity, innovation, and exploration require the right kind of risk taking that leads to the right kind of errors and puts us on a path safe from The Misfits. While Hugo Chavez desperately searches for a medical cure and Hail Mary from Jesus, his fellow Misfits in Argentina have banned foreign books under the phony excuse of containing too much lead. If a good man or woman is hard to find, so is a good cure.